Since the advent of the App Store there is a very capable last.fm client available for download. However, due to the restrictions placed on the official SDK it cannot scrobble tunes. 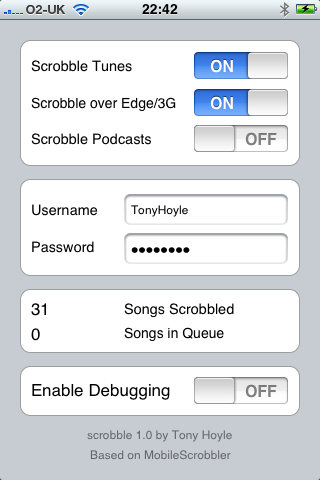 To work around this problem this is a conversion of the scrobbler part of MobileScrobbler to the iphone v2 software. It sits in the background and takes note of which tunes you're playing and scrobbles any tune played on the iphone to the last.fm servers. The source code is available under the terms of the GNU General Public License version 2. You can download a copy of the scrobble source code here: http://www.nodomain.org/scrobble/scrobble.tar.gz.